2018 Fontaine RENEGADE LX40 29FT - Double Drop Deck Trailer in Caledonia, Wisconsin - Stock# 575574 LX40 29FT - ILoca Services, Inc. 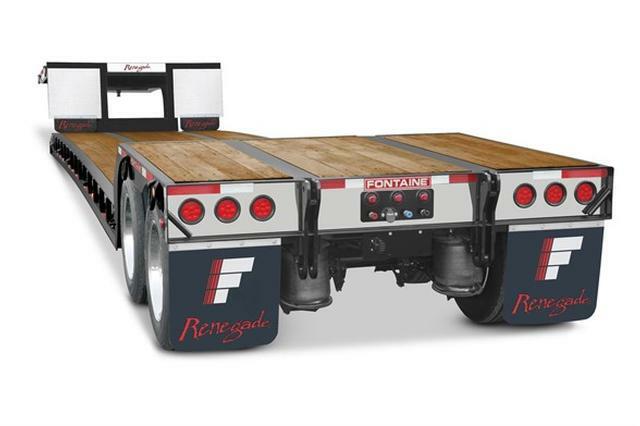 Please contact me regarding the 2018 Fontaine RENEGADE LX40 29FT - Stock# 575574 LX40 29FT for sale at TruckerToTrucker.com. Take a look at this 2018 Fontaine RENEGADE LX40 29FT. It is Stock# 575574 LX40 29FT at TruckerToTrucker.com. 2018 Fontaine Renegade LX40 29ft 40 Ton Air Ride Mech. Double Drop, 18 Deck Height. Find out why more fleets and owner operators run with Fontaine® than ever before! True 40 ton capacity in 16 feet (GAWR and tire ratings determine legal payloads) Mechanical, removable gooseneck with fifth wheel guide rollers 81 swing radius with 9' 10 overall gooseneck length. Flat, level deck with 29' clear deck length. Loaded deck height: 18 with 6 ground clearance. Sloped front ramp features traction cleats for easier loading and unloading. Air-ride suspension with automatic and manual controls. 2-part polyurethane enamel coating fights corrosion to extend trailer life. Call ILoca Services, Inc. Your Partner For The Long Haul ® today!!! FET Included in price. FOB Caledonia, WI Not as pictured, pictures represent trailer. Trailer available has Steel Disc Wheels.